It’s been quite a while since an alpha build of Outer Wilds took home the grand prize at the IGF Awards – almost three years, in fact. But the striking space exploration game now has a brand-new trailer, and it’s clear that a lot has happened since we last looked in. If you enjoy the thrill of exploration and discovery, check out our list of the best adventure games on PC. 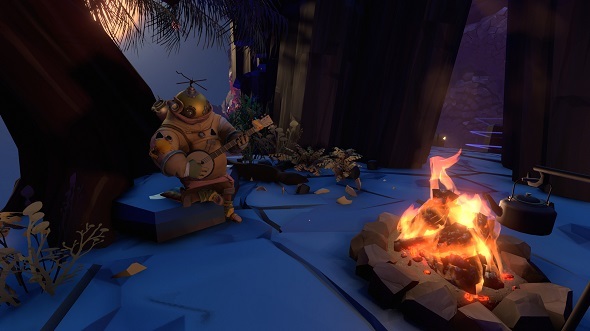 The trailer (which you can watch above) begins with a cozy campfire, where we’re roasting a marshmallow with our friend the banjo-playing deep-sea diver. But the peaceful scene is interrupted when we’re all sucked into space by several large tornadoes. Outer Wilds is set for release sometime this year. You can find more information at the official site, and on the game’s new Steam page.